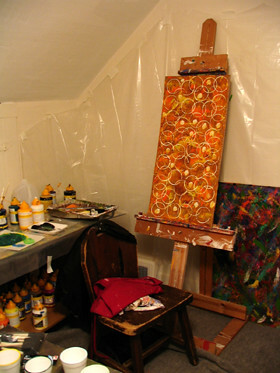 This is a photo of my painting studio. I slop a lot of paint so I had to cover the walls with some plastic. On the easel is a completed abstract cardboard painting before I placed it in a public place for someone to find. Ironically there's a canvas behind the easel where I clean my brushes. There are days when that canvas looks better than anything I've actually painted.